Continuing the cigar journey, like no other! Join us along with Jeffrey Groover and Jarrid Trudeau, Vice President Kristoff Cigars for a night of good deals on great cigars, and good fun! Join us on Friday November 17th from 5p.m.-9p.m. for an E.P. Carrillo Bash hosted by Lissette Perez-Carrillo! We’ll have SUPERB Deals on all EPC Cigars, and we’ll also be holding the drawing for our E.P. Carrillo 55″ HDTV Giveaway. Buy 5 Get 2 FREE! 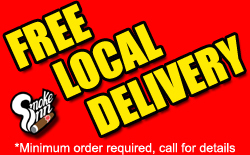 Buy a box receive 8 FREE Cigars! Buy 2 boxes receive 20 FREE Cigars! Join us on Friday, November 20th from 5pm-8pm as we welcome Billy Perdomo back to the shop! Billy will be bringing the deals on all Perdomo Cigars! 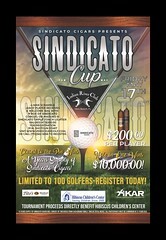 Don’t miss this evening filled with Perdomo cigars, food & drink, and great company! Meet Rocky Patel on Friday, December 12th from 5pm-8pm, as he hosts our 2014 Holiday Party! Buy 2 Single Cigars and receive a raffle ticket for the 48″ Sony Bravia Drawing! Buy 3 Single Cigars, Get 1 FREE! Buy 5 Single Cigars, Get 2 FREE! Buy any RP box, receive 20% off and get your choice of Rocky Patel Three Finger Case, or Rocky Patel Torch Lighter, plus Five FREE Cigars! Buy 2 boxes, receive the discount and 10 Rocky Patel Cigars, Rocky Patel Torch Lighter, plus the Rocky Patel Three Finger Case! Buy 3 boxes, receive the discount and get 15 FREE Cigars, Rocky Patel Torch Lighter, Rocky Patel Three Finger Case, plus 100 count Rocky Patel Cigar Humidor valued at $270.00! All customers who purchase ANY of the above deals will be entered into the hourly giveaways from under our tree! Don’t miss an evening with Rocky at our BIGGEST Event of the Year! Rocky Patel Cigar Bash iPad Giveaway! 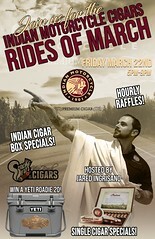 Join us along with Hollywood Jose, Rocky Patel Cigars on May 23rd from 5pm-8pm for GREAT Deals and Giveaways! See you on the 23rd! Click on the picture for a Virtual Tour of our store!